State Legislator Lew Frederick, a real champion for education, is sponsoring a bill in the coming legislative session protecting student records and privacy. We urge you to contact legislators in support of this bill. BACKGROUND: Recent administrative decisions by the U.S. Department of Education to FERPA (the federal law governing student data privacy) have weakened privacy safeguards and shifted the burden of privacy protection to the States. The creation of a network of Statewide Longitudinal Databases (SLDS) containing individual student records has further put students at risk. The student records include information about grades, test scores, attendance data, disability and health, family relationships and disciplinary data. Rep. Frederick's bill (HB 4062) protects and limits the use of student data by specifying it may only be used for the educational benefit of the student and by protecting parent, student and teacher rights. 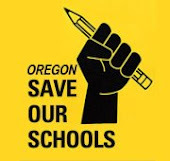 This is a continuation of a bill which Oregon Save Our Schools helped draft. We are indebted to Lew for his work in this area and for his continual work in understanding Oregon’s educational system and standing up for its children. 1) Contact your legislator and ask them to support this bill. 2) Contact your school board members and ask them to support this bill. Privacy protections won't happen without public support. Working together with legislators like Lew Frederick and the other sponsors of this bill we can create laws that put the safety and security of our children first (not corporate profits).